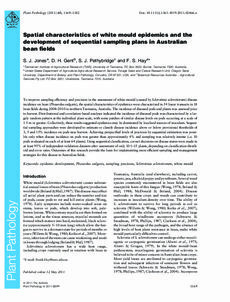 To improve sampling efficiency and precision in the assessment of white mould (caused by Sclerotinia sclerotiorum) disease incidence on bean (Phaseolus vulgaris), the spatial characteristics of epidemics were characterized in 54 linear transects in 18 bean fields during 2008�10 in northern Tasmania, Australia. The incidence of diseased pods and plants was assessed prior to harvest. Distributional and correlation-based analyses indicated the incidence of diseased pods was characterized by a largely random pattern at the individual plant scale, with some patches of similar disease levels on pods occurring at a scale of 1�m or greater. Collectively, these results suggested epidemics may be dominated by localized sources of inoculum. Sequential sampling approaches were developed to estimate or classify disease incidence above or below provisional thresholds of 3, 5 and 15% incidence on pods near harvest. Achieving prespecified levels of precision by sequential estimation was possible only when disease incidence on pods was greater than approximately 4% and sampling was relatively intense (i.e. 10 pods evaluated on each of at least 64 plants). Using sequential classification, correct decisions on disease status were made in at least 95% of independent validation datasets after assessment of only 10򶞏5 plants, depending on classification threshold and error rates. Outcomes of this research provide the basis for implementing more efficient sampling and management strategies for this disease in Australian fields.